Also see Miracle Mile Tenants. Readers are encouraged to contact us with any additions or corrections. 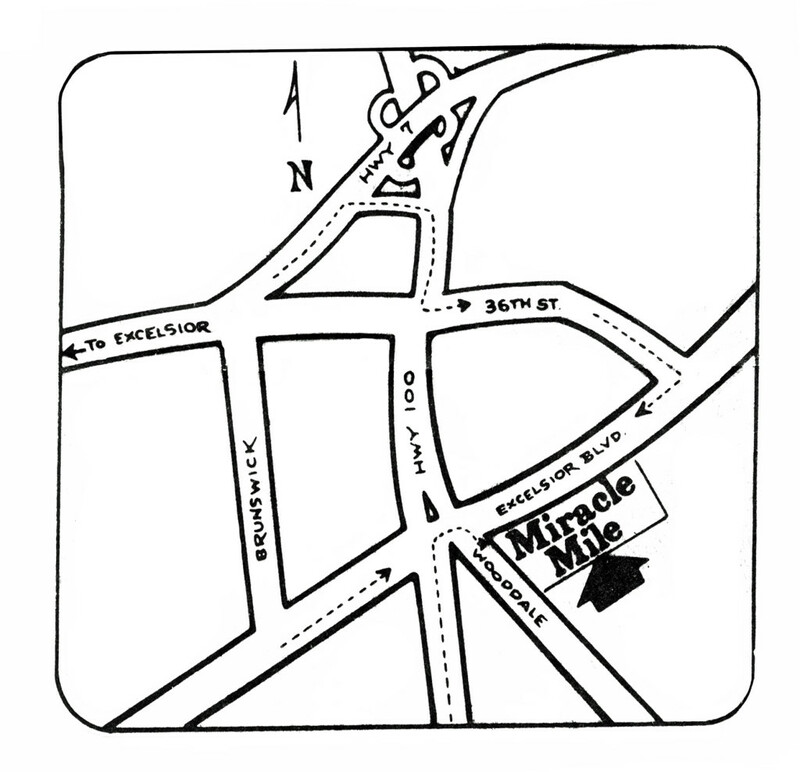 The land upon which Miracle Mile was built may have been first owned by Mrs. Margaret (Frank) Scott, as indicated on an 1874 map. Mrs. Scott was a sister of Joseph Hamilton, and was left a widow in about 1865 with six sons. It was she who, in 1878, donated the land for Park’s first church, Clarke Chapel, on a site that is now that of Most Holy Trinity. Martin Pratt owned the land on the other side of Wooddale, however, and the map does not make the property line clear. A subsequent map shows that the 30 acres in the southeast corner of the intersection of Wooddale and Excelsior Blvd. was owned by Ellen Poole. This is confirmed by an 1881 directory showing that R. Poole, gardener, owned 20 acres in the area, and by an 1889 map that shows Ellen Poole again owning that corner. A map dating to 1914 shows that the land (8.65 acres) belonged to Mathilda A. Shepard, presumably the wife of Nathanial Shepard, the asparagus farmer across the street. And indeed, the 1926-27 shows that Nate Shepard owned the land in question. The 1933 map shows nothing but a stucco house on Wooddale and a Minneapolis Gas Light Co. booster station on the property. 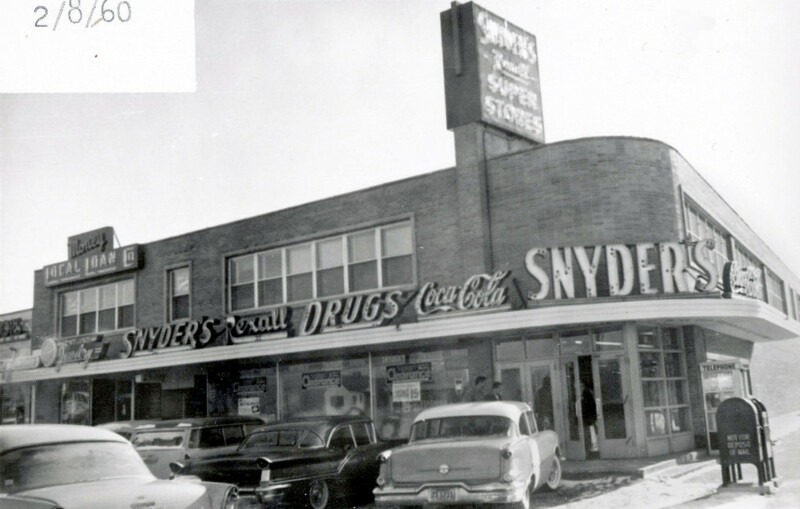 In the 1930s the land was remembered as a pasture for two tethered Jersey cows, “an incongruity even at that time.” There was a big sign where Snyder’s Drug Store would be that said “For Sale cheap because of non-payment of taxes.” In 1940 Si Rutherford bought at least part of it for $25 per lot for his garden implement business. When he heard about the plans for the shopping center, he was heard to say, “I’ll never have to work again!” He built another store further east, and despite his windfall, he continued to run his business in the new location. In 1950 the firm of Sheldon-Thomas, Inc. bought the land from W.M. Livingston (Minneapolis) and S.F. Carmean (St. Louis Park) and requested a permit to build a 14-store shopping center, estimated to cost around $1 million. The plan was presented to the Village Council by a Phillip Neville. Despite a petition against the plan signed by 425 residents presented to the Village Council by attorney Hyman Edelman, the permit was granted on July 20, 1950. The subject of the objection was a 50-ft. driveway into Wooddale Avenue that was originally supposed to be part of a 100-ft. buffer strip between commercial and residential zoning. The President of Sheldon-Thomas was identified as Charles M. Redman (d. November 1, 1959). Original plans for the red brick building (since covered over) called for a medical center catering to pediatricians, a 500-car parking lot lit by 20 light towers, and a heated bus station that would allow buses to pull well away from Excelsior Blvd. so as not to block traffic. 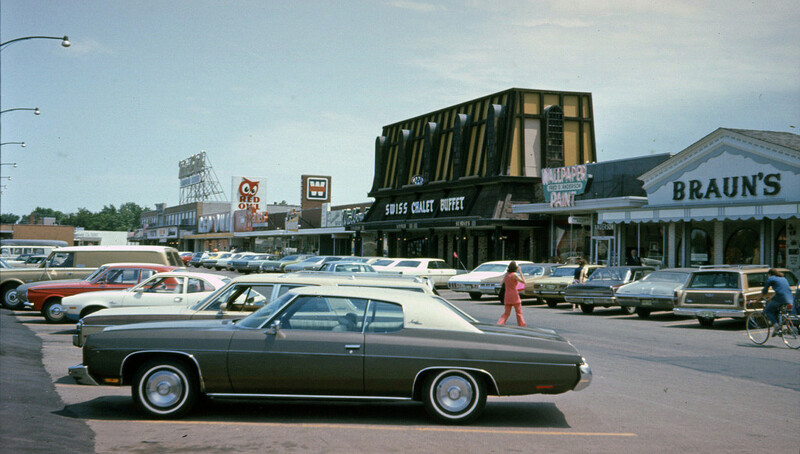 The 154,000 square foot shopping center was touted as the first shopping center of its kind in the Upper Midwest. The project was built in two phases, with the western end built first. 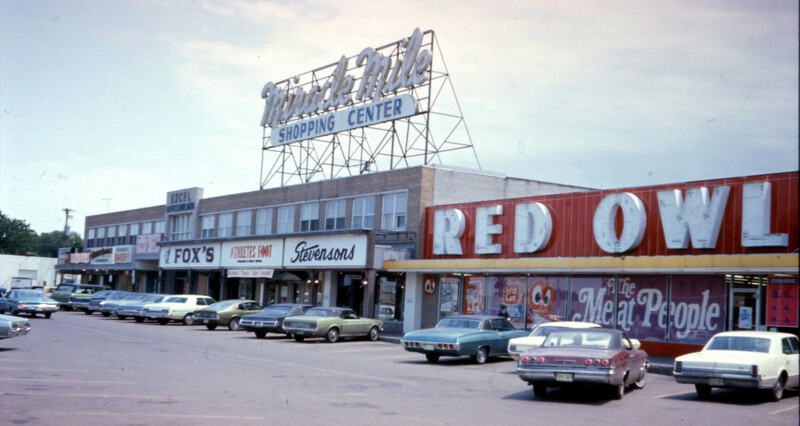 Red Owl stood at the easternmost end, and Snyder Drug held the corner of Excelsior and Wooddale. The first store to open on the Mile was Warner Hardware, which opened on May 5, 1951. President Leon C. Warner and store manager Wally Dahl greeted acting Mayor Torval Jorvig, Chamber of Commerce President Henry Albrecht, and 11,000 shoppers with “1,000 fresh, dainty, beautiful princess Aloha orchids…flown direct here all the way from Hawaii…,” reports the Dispatch. Over a mile of wire border fence was sold, making good St. Louis Park neighbors, presumably. 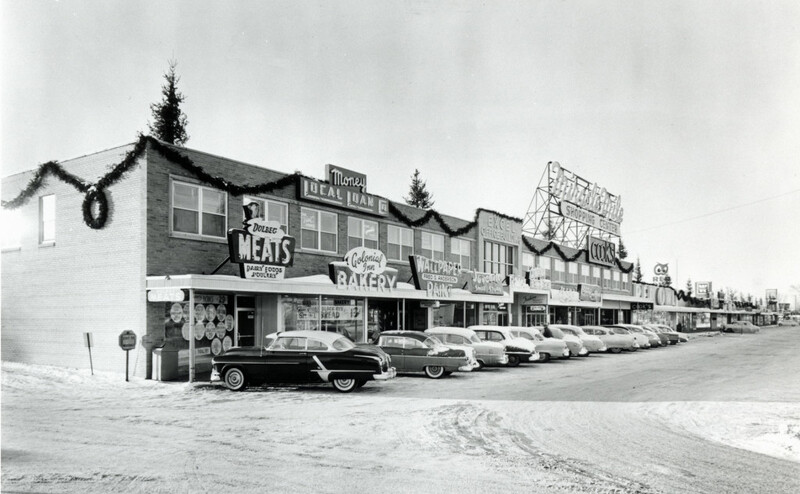 Stores opened almost one by one, and the Grand Opening of the shopping center as a whole was not held until early November 1951. The second phase was located at the eastern end. 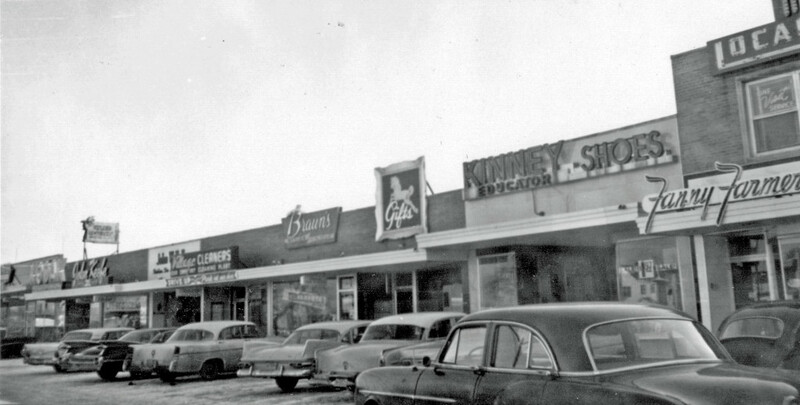 In November 1952, Shopping Centers, Inc. and Wood-Excel Co. obtained the building permit. 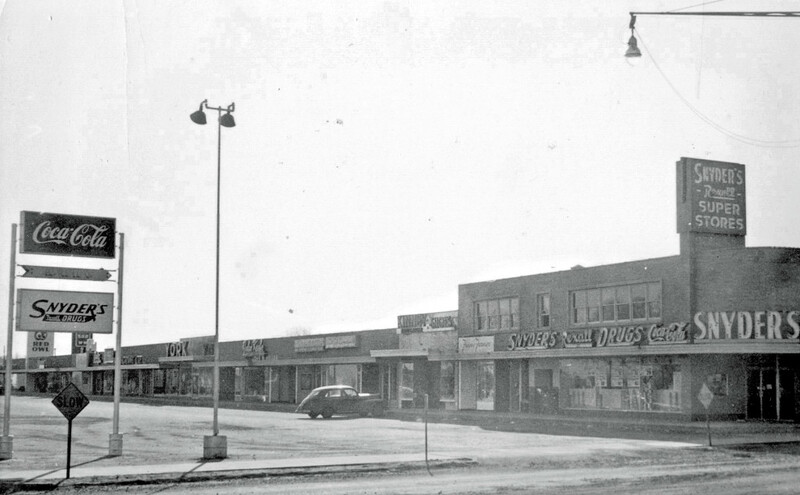 The two-story addition, known as the Excel Building, was built to house five small shops and seven larger stores, with a total floor area of more than 18,000 sq. ft. Original plans called for medical offices and overnight hospital facilities for children on the second floor. The architect was M.O. Nathan and Assoc., a Chicago firm, and the contractor of the concrete block building was Kraus-Anderson, Inc. That section was to take in the Rutherford Building, which had just been built. 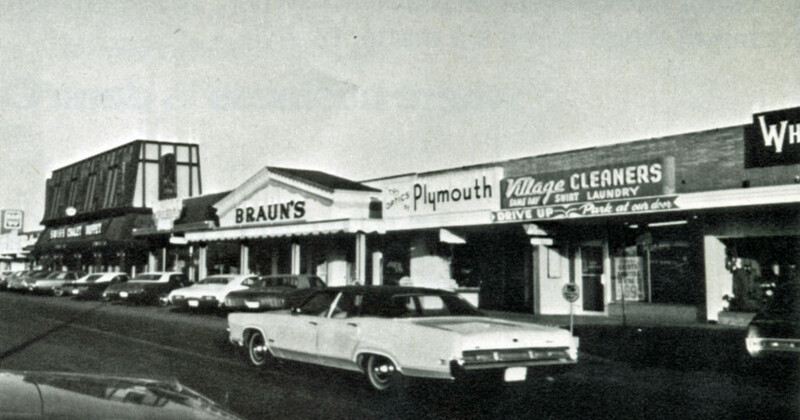 The first tenants of the eastern section of Miracle Mile began to open for business in May 1953. They were to include Abdullah’s Luncheonette, Juvenile Shoe Store, Anderson Artists Supply and Gift Shop, Mills Sisters Beauty Shop, a pet shop, Del Fabrics, and the New Yorker delicatessen. Not all of these businesses actually occupied the premises, however. The grand opening of the Excel Building was November 15, 1953, and the owners were now listed as Shopping Centers, Inc. 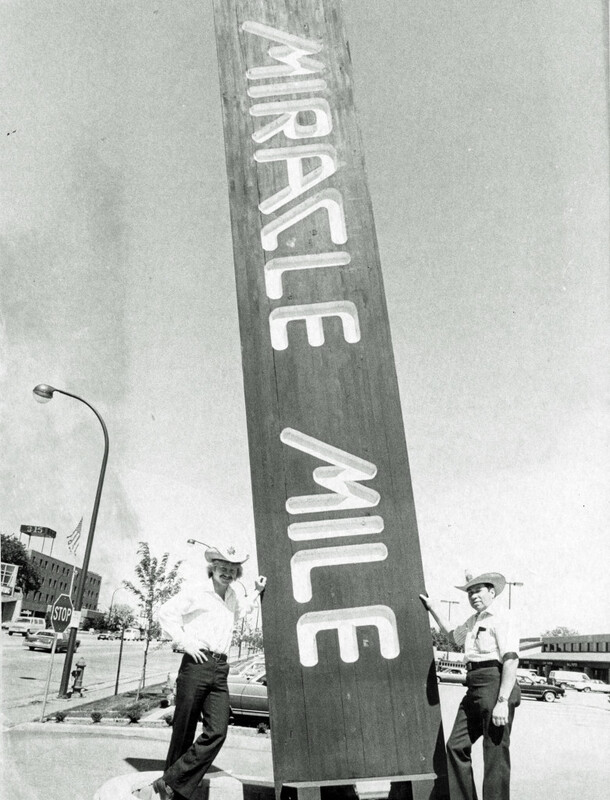 The owners of Miracle Mile also owned similar properties in Rochester, Brainerd, and Milwaukee, all called Miracle Mile. IDS (the holder of the mortgage) bought out the partners in the mid-1950s and sold all four properties to Corrigan Properties, owned by Leo Corrigan, Sr. Corrigan’s family had immigrated to America from Ireland in 1849, settling in St. Louis. Leo, one of perhaps a dozen children, traveled to Dallas to seek his fortune. Despite his fourth grade education, he got a job at a newspaper taking want ads. The ads for rental properties caught his eye, and he decided to go into the real estate business. Corrigan Properties, the privately-held family corporation based in Dallas, was incorporated in 1949, and that entity owned of all of the family’s properties. Under Leo Corrigan, Sr.’s leadership it became an international concern, building hotels in Nassau, Hong Kong, etc. Sometime between 1952 and 1956 WTCN-TV’s Jack Thayer and his wife Donna hosted the “Miracle Mile Theater,” where they would show a movie interspersed with commercials for 16 stores in Miracle Mile. October 8, 1952, was Wellesley Day – what was that? An ad said welcome from Angela’s, Betz, John W. Heller, John Keefe, and Pink Pony. Maybe they were having a convention. Lights in the front parking lot were replaced by ten mercury floodlights. The rear parking area, which had had no lights at all, now received illumination. A new traffic flow pattern was developed to eliminate congestion. 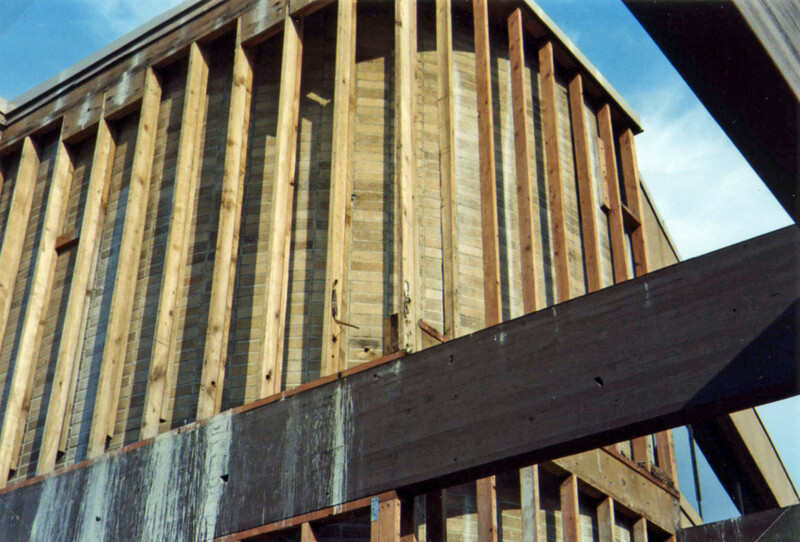 Additions of about 24 feet were made to the rear of several stores to provide more sales and storage area. The stores ran from 5301 to 5317. A new “step-saving walk-through for customers who wish to walk from the rear parking lot to the front of the shopping center” was installed at the Don Leary store. In 1957 Santa set up shop in a 40 ft. trailer in the parking lot, courtesy of Keller Bros. Camera and Sporting Goods Store. The actual appearance of Santa was sponsored by the Miracle Mile Merchants’ Association. Draper and Kramer was the complex’s manager from at least 1965 to at least 1974. In 1966 there was apparently some reshuffling, and three stores: Becky’s Chalet Buffet, Fox’s, and Haugland’s advertised their new, expanded locations. When Leo Corrigan, Sr. passed away in 1975, the family business was reorganized and properties were distributed between the families of his son Leo, Jr. and his daughter Louise Corrigan Jordan. Corrigan Properties was renamed Intercity Investments Properties, Inc., and Louise Jordan’s son Burt became President in 1983. Although based in Dallas, Mr. Jordan takes a personal interest in the management and health of Miracle Mile, which has been free and clear of debt since the 1990s. In 1980 plans were made to renovate the Mile. City Planner Bill Thibault commented in an article dated May 14 that “One big concern of residents is the unsightly condition of rubbish piling up in back. That’s been going on for ten years.” The company promised to construct six enclosed trash areas in the back. In 1981 the mall underwent a Mediterranean-styled facelift to coincide with its 30th anniversary. Uniform stucco siding, new roofing and windows and a canopy that stretched the full 700 feet of the Mile over an enlarged pedestrian mall were installed. 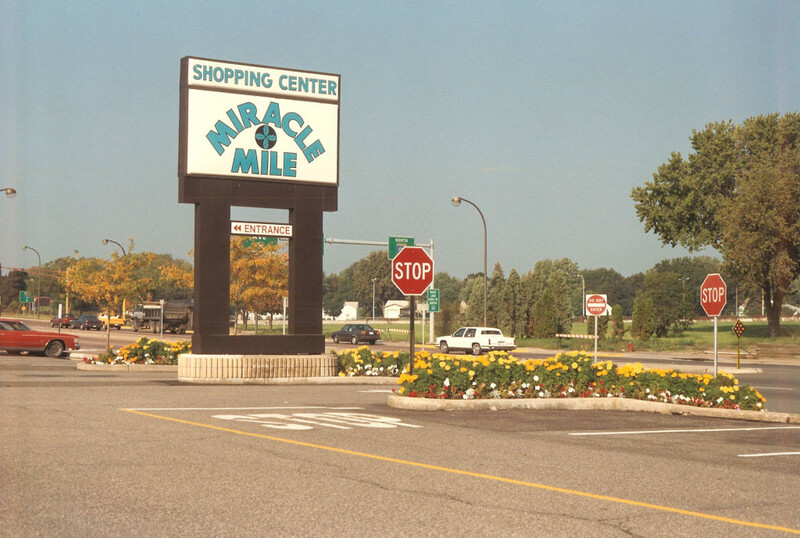 A neon Miracle Mile sign was removed and uniform store signs were installed. To celebrate, the mall had “Miracle Mile Bull Days” from July 9-11, 1981, which featured country music. You could also ride Diablo the Mechanical Bull for $1. In 2004 Schuler Shoes moved east into recently vacated space. There were more vacancies, until 2006, when Hoigaard’s made major renovations to the west side of the building. During the course of the deconstruction and reconstruction, some of the original brick was exposed, including the wonderful curved corner where Snyder’s was. In 2006 Hoigaard’s moved from its location on Highway 100 to the western end of Miracle Mile, filling much long-vacant territory. The store had a cabin-type decor that made use of wood and stone. In 2007 the mall was updated, in part to match the new Hoigaard’s store. Pillars were covered in stone and there was a new wood treatment in the front. Many stores presented new signs, as well.